I whipped this up tonight as tracking this may be relevant given that we can manually trigger it now. This was designed to go above my modified version of Pawkets' WA2 setup. Layout should be easy enough to tweak if you want to change how it looks! Possible there is a better way of doing this via the events, but I think this is probably the most straightforward approach as far as I could see. Note, this only shows the base damage currently. 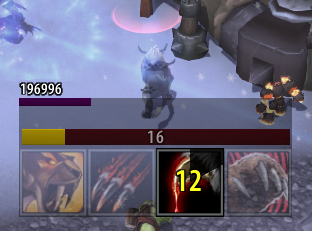 Would like to have the multiplied values via the equipped trinket ilevel, but didn't have time to look into how to get the bonus IDs to figure out Warforged. May try to do this if I have time. Last edited by Kojiyama on Fri Jul 03, 2015 2:25 pm, edited 3 times in total. Heh, I just made one yesterday as well. Not really as a final product since it wasn't for myself, more as a proof a concept I guess. It does account for the explosion multiplier though and also does a few things a bit more efficiently than yours. Didn't think of using on hide to reset the counter though, I was watching for SPELL_AURA_REMOVED for that which I suppose is a fair bit worse so I did adjust mine in that regard. A tip for making everything way easier & cleaner for custom coded auras: Unless you really need to be able to access the values from other auras, instead of using global values you should put them in the aura_env table which is a table weakauras provides specific to that aura. If you want to use a function you can define it in init and then put it in aura_env, what you did in your aura I can only assume is really inefficient since you're creating that function every time you trigger a damage event during the proc. I also did the same thing with the UnitGUID since that's constant, then you don't need to call the function on every single combat log event (I like to think this is really efficient but I guess the UnitGUID function is probably pretty cheap). Thanks for the tip. Yeah, originally I used globals because I had the tracker set up as a separate aura kinda like your snapshot tracker, then I realized I could actually merge it with the counter itself to take advantage of the hide trigger to reset stuff and shuffled the finished script into the other one. Haven't done a ton of WA scripting since I last played, so that's good to know about aura_env. Will restructure that slightly later. I kinda assumed that the local player's UnitGUID was probably a constant in a table already so assumed that one was pretty efficient, but putting it in the init seems reasonable. Just posted an updated/merged version above with some of your optimizations and the trinket multiplier based on the ilevel. Seems to work correctly as far as my dummy testing with my HWF version. Thanks alot for this one! I have my game in Spanish, so the WA doesn't work for me. Can you please tell me what should I change to make it work? Swapped UI today to LifeLeaf's awsome compilation, https://www.youtube.com/watch?v=vJupGrmskDQ for those who is intrested in how it looks. Got a problem with this and most other WA's that tracks the DMG on soulcap and prints out the numbers. I just can't get any of those to work, this included. I turned on LUA errors, but doesn't get any lua errors either. I had this problem before a couple of times, usually resolved it self with a /reloadui, but now it's constant, reloadui/login/logoff game doesnt resolve it either. Im completly out of ideas, tried this WA, one from the rogue counterpart to Fluiddruid (ravenholdt), one i found on mmo-champ and one from the offical forums, ofcourse checked the load settings, and removed each WA after i tried it out so it couldn't interfeer. Anyone have any ideas at all?, I don't think im alone when saying that knowing how big your spirit shift damage is currently is essential for different types of situations.